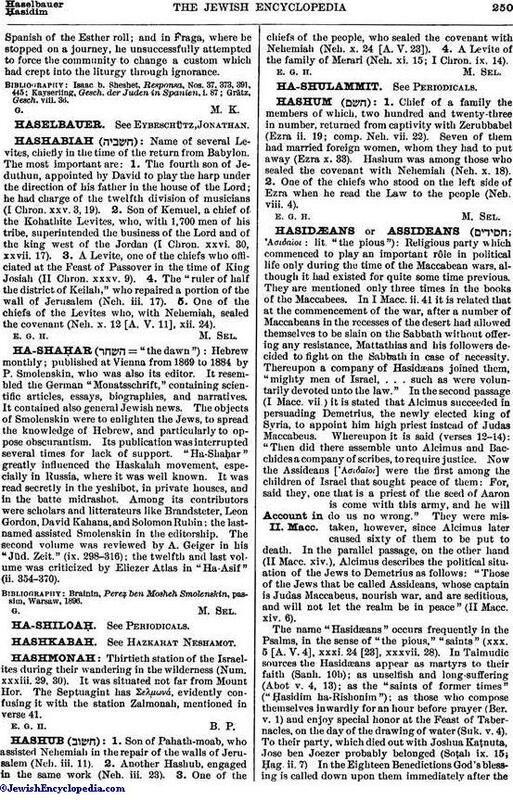 Name of several Levites, chiefly in the time of the return from Babylon. The most important are: 1. The fourth son of Jeduthun, appointed by David to play the harp under the direction of his father in the house of the Lord; he had charge of the twelfth division of musicians (I Chron. xxv. 3, 19). 2. Son of Kemuel, a chief of the Kohathite Levites, who, with 1,700 men of his tribe, superintended the business of the Lord and of the king west of the Jordan (I Chron. xxvi. 30, xxvii. 17). 3. A Levite, one of the chiefs who officiated at the Feast of Passover in the time of King Josiah (II Chron. xxxv. 9). 4. The "ruler of half the district of Keilah," who repaired a portion of the wall of Jerusalem (Neh. iii. 17). 5. One of the chiefs of the Levites who, with Nehemiah, sealed the covenant (Neh. x. 12 [A. V. 11], xii. 24).